Symposium: Good Work for Good Health What role can you play? In this webinar David Booth, Chair of the Standards Group, will be talking about the main updates to the Standards. He will also highlight key things that practitioners should be mindful of in their practice. In this webinar, Nancy Hey, Director of the What Works Centre for Wellbeing, will give an overview of the latest evidence relating to wellbeing and work and what can be done to improve understanding of what has the greatest impact. Collaboration not competition is fundamental for the future and this is absolutely the case in the sphere of occupational health. The occupational health profession is diverse and varied with professionals coming from many different parts of medicine, nursing, the allied health professions, psychology, occupational hygiene, health and safety and ergonomics. Each of the professional groups however is small and, perhaps with the exception of health and safety professionals, have limited visibility and voice within their ‘parent specialism’. As professionals they work in, and across, the public, private and voluntary sector. They often have portfolio careers that patchwork together clinical practice in different settings, industries and sectors, all working to enable individuals to remain in, or return to work in ways that work for them and their health conditions. As the public sector faces an ageing population who are living longer with increasingly complex needs there is an understandable focus on shifting training resource into areas of acute pressure like general practice and geriatrics rather than into occupational health training. Although there is a strong case that reducing training capacity in the professionals will ultimately be a false economy, something to discuss in another blog! Over the last fifty years there has been a fundamental shift in the nature of work and the change continues to accelerate and deepen in its implications for individuals and for occupational health. Digital and technological breakthrough has seen many employees moved away from the high occupational risk exposures of front line heavy manufacturing processes to technical, hospitality or administrative roles. Patterns of musculoskeletal disease may well shift from lower limb and lower spinal issues to upper limb and upper spine issues linked to the way we use our computers and phones rather than the way we lift and twist. This sits alongside the shift to mandatory manual handling training and office health and safety instruction which has increased both employer and employee understanding of health and safety as well as the strengthening through case law and legislative reform of the punative risks associated with organisational negligence and accountability. Finally the global nature of business also provides a new dimension of occupational health with 4 out of 5 jobs in the top 40 economies linked to directly to global supply chains and business networks. Both recreational and occupational travel creates new vectors for disease communication as well as new dimensions of cross-cultural occupational health practice. The landscape of occupational health has never been more complex and that is why collaboration is key to the future of occupational health practice. It is only by working together across professional and sectoral boundaries that as partners in the Council of Health and Work that we can make the leaps and bounds that are needed to respond to, and position for, the changing and evolving future of work and health. One of the recommendations from the Improving Lives Command Paper published in November 2017 was the introduction of a Medical Champion for Work as a Health Outcome. In our conversations with patients, healthcare practitioners are used to asking questions about the lifestyle factors that underpin health such as diet, exercise, alcohol and smoking. But there’s another important question that we need to consider: ‘How is work?’ This role aims to support colleagues in understanding the importance of work as a health outcome with guidance around having those conversations. Good workis good for us. It isn’t just about gaining economic benefit but more to do with social connections, physical activity and intellectual challenge. There is clear evidence to show that good work helps us to be healthier and happier. Conversely being out of work increases our patients’ risk of ill-health. Long-term unemployment increases the risk of limiting illness and worsening mental health and the longer we’re out of work; the more likely it is to impact on our health. Working can be considered a health outcome in itself, reflecting how well we are supporting individuals to adapt to or recover from their health challenges. In general practice we have an opportunity to use our trusted relationships with the people we care for to help them maximize the health benefits of being in work. This could mean preventing our patients from falling out of work, or for those who aren’t working because of a disability, medical condition or injury, helping them return at a time that’s right for them and their health. It can all start with a conversation. There’s so much we can do to help people stay in and return to work, from providing key information or boosting a patient’s confidence through to helping with pain management or coping with stress. For example, clinicians can signpost to resources that charities have developed to help our patients, and their employers, to maintain good work and good health. Conditions covered by these resources include people with cancer, musculoskeletal pain, mental health problems and heart disease. And crucially, we can make an impact even when our time with patients is limited. 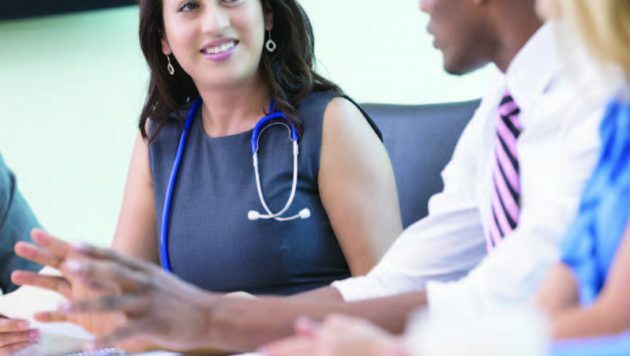 Starting conversations about work– asking patients about their work is clinically useful in itself, but it can also open up an opportunity to talk about how important work is to them, how confident they are and whether their health is proving to be a barrier. Discussing reasonable adjustments– employers have a legal duty to consider reasonable adjustments but many people haven’t considered this as an option. We can raise awareness of opportunities that could be offered by an employer for instance flexibility around hours or changes to the working environment. Work from the Improving Lives paper, is already under way to help one million people with long term physical and mental health conditions stay-in or return-to the workforce. This is an ambitious plan to change the landscape and move vocational rehabilitation closer to mainstream healthcare. Ultimately we need to ensure that people are supported by employers that are committed to creating healthier workplaces and the right health and wellbeing support for their staff. We also want everyone to understand the importance of work as a health outcome and feel supported by a health system which promotes an understanding of good work and good health. M. Marmot, 2010. Fair Society Healthy Lives, The Marmot Review. Over 2 million people are living with an illness or injury caused by their work. We need to work together to both prevent this happening and also support those who are made ill through work, that is why there is a need for a multi-disciplinary approach that seeks to address the issues at source.